A range of Repair Kits from SurfCo and Seabase. Some are travel safe. Repair Kit Rubberized - Quickfix 2oz by SurfCo. 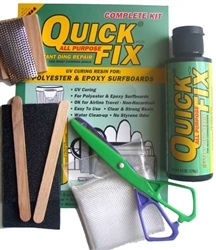 Surfboard repair kit - Quickfix 0.5 oz by SurfCo. Surfboard Repair Kit - Quickfix 2.5 oz Universal by SurfCo. Surfboard Repair Kit - Quickfix 4.5 oz Universal by SurfCo. Surfboard repair putty -Quickfix by SurfCo. A range of Repair Kits from SurfCo and Seabase. Some are travel safe, some not. They all do the job well….